Dr. Kari Ragan teaches applied voice and vocal pedagogy at UW, but her interest in the science and medicine of the voice has been a boon to her students as she instructs them in not only the art of singing, but also the science. A graduate of the School of Music voice program who joined the faculty in 2010, Ragan has enjoyed a multi-faceted career encompassing both performance in classical, opera, and musical theater settings and voice instruction in her private studio. 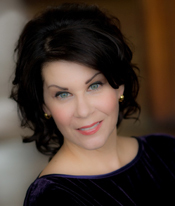 In addition to her teaching and performance career, Ragan also is a Singing Voice Specialist who has undergone extensive training in working with voice disorders in singers. Her work in the field of voice received important recognition recently when she was selected from a pool of nationwide candidates to receive the 2012 Van L. Lawrence Fellowship. Awarded jointly by the Voice Foundation and the National Association of Teachers of Singing Foundation, the fellowship recognizes excellence in teaching and encourages advances in the field of vocal science. The fellowship will enable Ragan to extend her research into the neglected role of cool-down exercises in maintaining vocal health and to continue to engage in interdisciplinary work with the UW Otolaryngology and Speech and Hearing Sciences departments. Ragan’s interest in vocal science predates her faculty appointment at UW, but has expanded significantly in her time here. In 2010, she initiated a pilot program with the Department of Speech and Hearing Sciences, working in collaboration with Martin Nevdahl, a speech pathologist and clinical supervisor in the department whose areas of interest include stuttering, voice disorders, and care of the professional voice. Through this program, Ragan’s voice students receive voice evaluations from Nevdahl and his graduate students, including laryngeal videostroboscopy (LVS). LVS provides a magnified, “slow motion” view of the vocal cords in action. This examination can reveal even subtle abnormalities in the vibration of the vocal cords. Students are then referred for appropriate medical evaluation if necessary. The exam results reveal data important to both singer and voice teacher. When singers suffer from vocal problems, Ragan says, it is critical that they seek proper medical attention from physicians in the field of Otolaryngology, which focuses on treatments and diagnosis of ear, nose, and throat (ENT) disorders. If possible they should see a laryngologist, who specializes in treatments and diagnosis of disorders and injuries affecting the voice, airway, and swallowing. UW voice students are fortunate to have resources in that field right on campus. Dr. Albert Merati directs the Laryngology program within the University’s world-renowned Department of Otolaryngology-Head and Neck Surgery, and his areas of expertise include care of the professional voice. Ragan’s students have benefitted from Dr. Merati’s proximity in numerous ways through his willingness to share knowledge in lectures, presentations, field trips and collaborative events between Music and Otolaryngology. He, along with Ragan, also serves on the board of the Voice Foundation, which advances such collaborations in the field of voice. Seattle’s chapter of the Voice Foundation is one of only four chapters nationwide. Its meetings, led by Dr. Merati, are held on the UW campus.